The McMordie Family successfully held for the second year with their Solpoll Herd the UK herd of the year for 2016, pictured is John and son Andrew receiving the award at the Pre Sale dinner held before Tuesday’s Show and sale in Hereford. 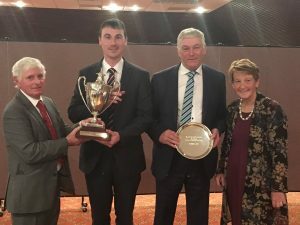 The accolade didn’t stop there with Solpoll 1 Gilbert owned by E Rees, Trefochlyd Herefords, Haverfordwest, Pembrokshire scooping the UK Sire of the Year for the second time in three years. Bred by J & W McMordie from Ballygowan, Co. Down, he was then purchased by DE, ED & AL Jones as a promising young bull to join their Dendor herd. 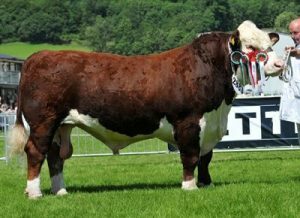 His potential soon came to fruition when in 2012 he took the Royal Welsh Show Supreme Championship. Six year old “Gilbert”, who is out of Solpoll 1 Pansy D3 and by Christies 1 Radar has a tremendous set of Performance Recorded figures which include 400 and 600 day weights, scrotal size and carcase weight all in the top 1%. These impressive figures culminate in a Self-replacing and Terminal Sire Index in the Top 5% of the Breed.